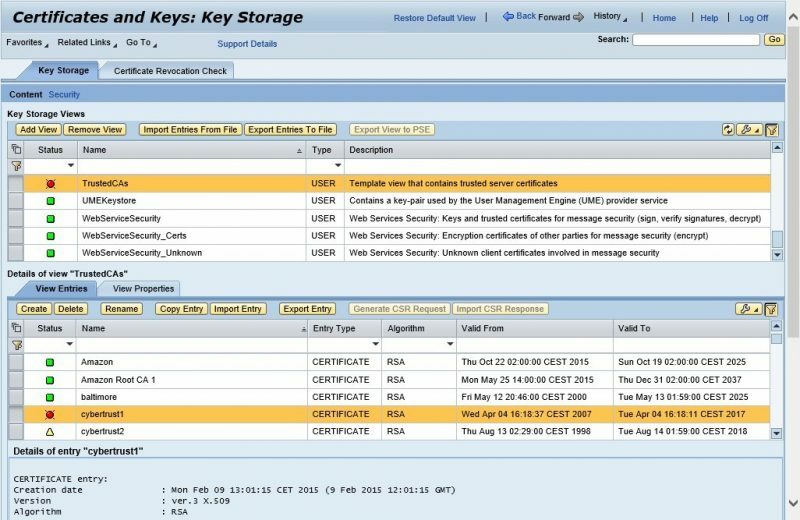 WHINT Interface Monitoring now supports Keystore Alerting (available as of SAP PO 7.50). A periodic job is scheduled using WHINT MessageTrigger Job which reads the Keystore from the NWA of any SAP Java System. Install Process Integration Scenario “WHINT_InterfaceMonitoring_Keystore” of namespace http://whint.de/xi/IMS/Keystore. You can use the same Sender/Receiver Combination as with the InterfaceMonitoring Snapshot. Enter ScenarioSender to match your Integrated Configuration. To reuse the same sender system as for your WHINT InterfaceMonitoring Snapshot, you can add a virtual receiver to your Integrated Configuration/iFlow. The global configuration is performed as mapping parameters in the Integrated Configuration / iFlow.